“The rich taste of coffee, the health benefits of herbal tea! Teeccino comes French Roast style (suitable for drip coffee makers)— intense deep coffee notes from roasted ramon seeds and chicory roots create a robust, focused body without any sweetness. And as tea bags, including 3 new flavors: Dandelion Turmeric, Dandelion Coconut, and Dandelion Red Chai. 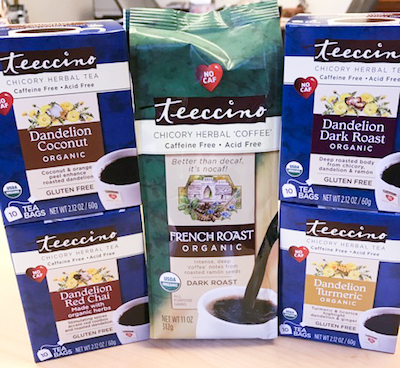 Created especially for the gluten-sensitive, organic roasted dandelion roots replace barley in Teeccino’s new Dandelion Herbal Coffees for the same delicious flavor and health benefits in every cup of Teeccino. If you have a coffee ritual, it’s tough to think about quitting it altogether. While in the short term you can self-treat migraine attacks with coffee, long-term you can be creating rebound headaches and turn an occasional problem into a chronic problem. Chicory root coffee has been served in the South for years (such as at Café du Monde in New Orleans). While this doesn’t taste exactly like coffee, it has a rich, full body that’s far more like coffee than herbal tea. The French Roast includes roasted barley as an ingredient, but according to the company the gluten doesn’t show up in the brewed liquid because it’s not water-soluble. They can’t officially certify it “gluten-free” but they do have laboratory tests to back this up. If you’re strictly celiac, I would avoid this flavor to be completely safe. Otherwise, brew away! Required FTC disclosure:Teeccino is providing one set of items for the giveaway, and they are providing samples for my book events. I was not paid to write this post.